The Carrier Cart takes device management to the next level: it is a complete system that offers more flexibility than any other Cart in it’s category. 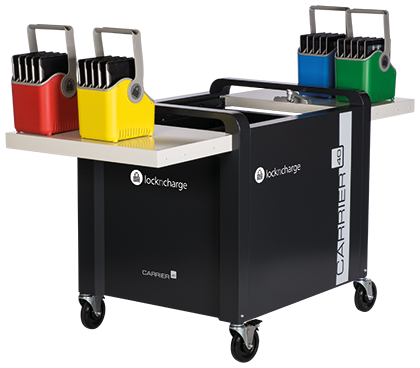 Baskets by LocknCharge give users the flexibility to deploy Chromebooks and Tablets with ease. The new large baskets are designed to accommodate almost any device, with or without cases. Safe, efficient and a future proofed power management system for charging up to 40 devices at once. How? ECO Safe Charge™ can handle the power requirements of almost any device by staging the availability of power to each bank of devices. New soft closing, sliding hood secures up to 40 Chromebook or Tablet devices and the baskets that they are stored in! Improved cable management. The Carrier Cart features a new centre channel system which holds all the cables in place. It is now neater and easier to set up. The larger device storage area means that Chromebook or Tablet devices can be accessed easier and by more users at once. Highly secure. Two-point locking system to keep your valuable devices safe. Modular syncing (Optional). Think you may need syncing functionality in the future? Don’t buy a new Cart… Purchase the hand held iQ Sync Charge Box which allows you to carry the unit where syncing is required (sold separately). The Carrier Cart is capable of charging up to 20, 30 or 40 mobile devices simultaneously. The new Carry Baskets are designed to accommodate almost any device, with or without covers. After a day of use, lock the sliding top lids and attach the heavy duty anchor kit for securing the Cart whilst it’s not in use. Equipped with removable 5-slot Carry Baskets, making mobile device deployments easier. LocknCharge products are built to last the distance. The Carrier Cart features two sliding top lids so that devices can be accessed quicker, easier and by more users at once.